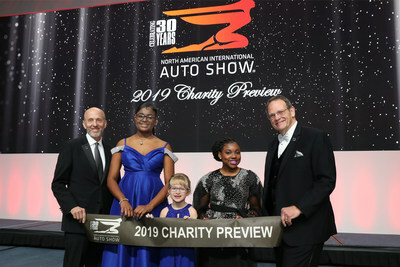 DETROIT, Jan. 19, 2019 /PRNewswire/ -- Marking its final Charity Preview in January and looking ahead to a new and transformed event in 2020, the North American International Auto Show (NAIAS) tonight capped off its 30th anniversary celebration by raising $4,028,800 for children's charities at the black-tie gala. A total of 10,072 people attended and raised a glass to commemorate the end of an era and the dawn of a new day for the NAIAS and the Charity Preview. Now in its 43rd year, Charity Preview has raised over $121M for southeastern Michigan children's charities since the Detroit Auto Dealers Association established the gala. Sponsored by Axalta Coating Systems for the fourth consecutive year, Charity Preview has evolved into the largest annual single-night fundraiser in the world. In announcing the monies raised, 2019 NAIAS Chairman Bill Golling revealed, "The Charity Preview event will continue to be a key part of our show going forward. We'll capitalize on the warm weather in June, perhaps with riverfront activities and outdoor activities." He noted the event is planned for Friday, June 12, 2020. NAIAS last year announced a transformational move for the show, including a date change to June. The reimagined show will allow exhibitors to deliver dynamic exhibits and experiential opportunities beyond the show's four walls– all taking place in the summer in a revitalized and reenergized Detroit. The Charity Preview event has become synonymous with the giving spirit and generous heart of the Motor City. Over the years, the gala has attracted a who's who list of top leaders from industry and government as well as sports figures and celebrities. Proceeds from tonight's Charity Preview directly benefit a wide range of children's charities. Funds raised will support services for children of all ages from birth to 18. Charity Preview closes out preview week at NAIAS, one that began last Saturday at The Gallery, a $10M car salon of exotic vehicles. Press Preview followed, featuring brand-defining worldwide and North American vehicle reveals and industry-shaping announcements, and AutoMobili-D returned for the third year with tech startups, mobility innovations and thought leaders taking center stage. Industry Preview was next on the agenda, connecting mobility professionals from around the world. NAIAS opens to the public tomorrow, Saturday, Jan. 19 at 9 a.m. Ticket prices and general show information, including transportation and parking can be found at naias.com.